TTIP is an undermining of hard won labour rights, citizen consumer and environmental protections and an erosion of the notion of democracy. We need to resist this blatant corporate power and resource grab Now. Meeting in Galway this week discussed and highlighted the insidious and secretive corporate and government collusion against EU citizenry that is TTIP. 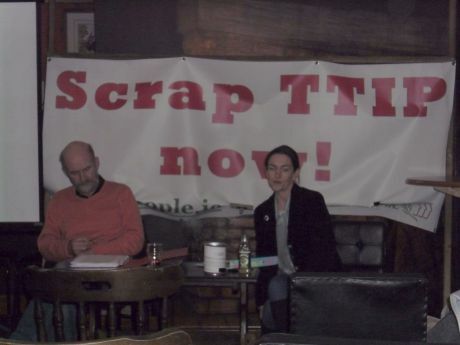 A report of the meeting follows..
Report from Galway Scrap TTIP meeting. 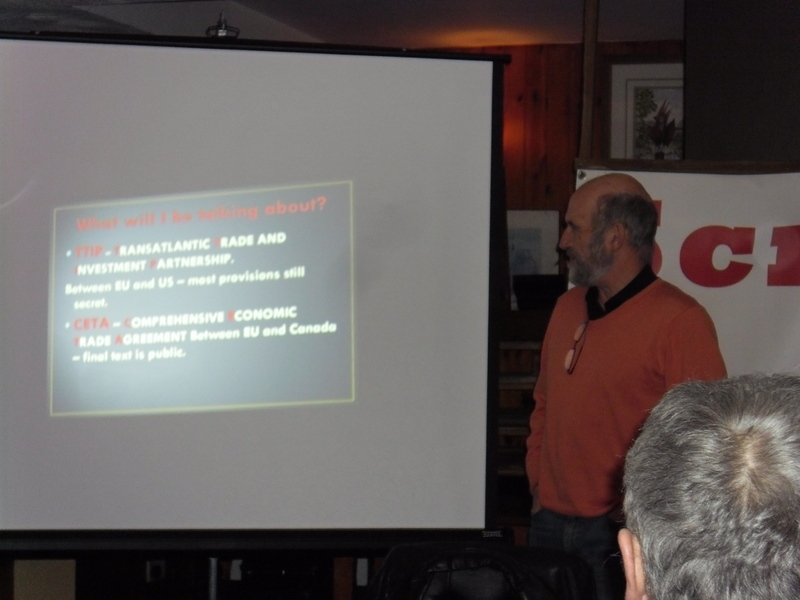 An informative talk about TTIP was held in Galway this week. The meeting was introduced by Dette McLoughlin. The main speaker was Mr Frank Keohane. Frank spoke at length about the TTIP, how it has been negotiated in secrecy by corporations and governments, what it's consequences are likely to be for ordinary people, ISDS arbitration and it's consequences for nation states etc. Of particular interest was the relationship between TTIP and Water services. The speaker discussed how these two issues, TTIP and water privatisation, were closely related and how it is necessary to see these developments, not in isolation, but part of a bigger picture. Also mentioned was the less well known little brother to TTIP, that is CETA which is the equivalent EU - Canada trade agreement. This is equally worrying and represents a trojan horse for US corporations who have operations and links in Canada. The speaker discussed how agreements like TTIP had their origins in bilateral trade agreements and the likes of NAFTA, which have been very destructive to the nations which entered into them. Mexico being a case in point. Using the example of toxic chemicals, he contrasted the approach in the US to their introduction which was basically to allow them until somebody produced strong scientific evidence to show that they actually killed people or caused harm. This differed from the European approach which was based on the precautionary principle, i.e. not allowing something until it can be proved safe for use. The US has introduced 24,000 chemicals into the market, many untested to any great degree, and only 8 have been withdrawn. TTIP is all about bringing down barriers to trade. To achieve this standards are always lowered not raised. In the example case of toxic chemicals, it will be the US approach which will be taken resulting in a lowering of protections for European consumers. Similarly undermining of labelling is likely to occur, GMO ingredients will become more prevalent and we won't be able to tell this from the labels due to undermining of our labelling laws to weaker US standards. Items like Chickens washed in chlorine will be allowed where currently our consumer protection laws do not allow them. This will be necessary in order for US corporations to be able to compete on an equal footing in the EU marketplace. Food treated with pesticides outlawed this side of the Atlantic will find their way onto our shelves and into our diets. Basically a complete undermining of food protections we have worked hard to build up will be washed away in one fell swoop with the enacting of legislation relating to TTIP, thus increasing corporate profits at the expense of the good health of European citizens. One of the most alarming aspects of TTIP mentioned by the speaker was the ISDS. This is essentially an extra judicial economic arbitration court populated by corporate lawyers which can make judgements against nation states for "potential lost profits" due to actions taken by nation states. For example nation A could enact a law which outlawed a certain toxic pesticide to protect it's citizens and it's waterways from harm. The vendor corporation who produces that chemical can then sue that nation for "potential lost profits" in a corporate court with the likely result that that nation will have to pay out a huge sum of millions or even billions to some greedy corporation under great pressure from the EU and US governing bodies and no doubt with severe penalties and consequences for not conforming. Essentially the process is anti democratic and turns the process of government on it's head. No longer is the welfare of the citizens of a nation the number one priority as it is actually supposed to be. After TTIP, the most important principle will be corporate profits and anything that threatens this, including legislation that acts to protect the health, well being and the environment of our citizens, will be attacked in the courts resulting in huge payouts to boost corporate profits. Money that should be used for public services. Essentially corporations will be steering the direction of government decision making using their financial muscle and TTIP legislation. It is no wonder this was all largely negotiated in secret, because the people involved were well aware that if people got wind of what they were up to they would not be happy. To highlight how secretive the participants were about the whole process, it was only because of a leak by wikileaks that these secret negotiations came to the attention of the public at large. We citizens of Europe need to mobilise and resist this process. It is not in the interests of ordinary people or of the notion of democracy. It only serves the interests of big business and their government service providers in the bureaucracies of the EU. It is anti Labour, anti democracy, anti environment and only has one value driving it. Profit. It is a ZIP file containing a powerpoint presentation.